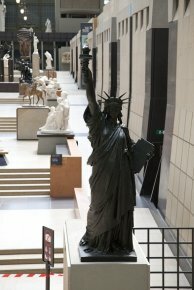 5/7/12 - Museum - Paris, Musée d’Orsay - The Musée d’Orsay has finally recovered the Statue of Liberty. This establishment had been requesting the return of the Bartholdi sculpture for over twenty-five years. It is a reduced model of the famous Liberty Lighting the World (1886) commissioned by the sculptor and founded by the Thiébaut brothers in 1889, presented at the Universal Exhibition of 1900, then acquired that same year by the French government for the Musée du Luxembourg, an acquisition suggested by the artist himself who turned over the work in simple exchange for the price of the founding. It illuminated the Luxembourg gardens, although not the world, as of 1906, placed there upon the request of the artist’s widow. When the Musée d’Orsay was created in 1986, with collections which came partly from those at the Musée du Luxembourg, to present works generally ranging from 1848 to 1914, the institution logically requested the statue, listed in the inventory. Jean-Pierre Bel, elected president of the Senate on 1st October 2011, finally accepted to turn over the work to Orsay. This decision may perhaps be a sign of one person’s good will, but it may also have resulted from an embarrassing discovery made a few months earlier in July 2011 : the flame had been stolen, and Liberty no longer illuminated much of anything. The conclusion was that it would be wiser to protect it from vandalism inside the walls of a museum. We were surprised not to have heard talk of this theft and to rediscover this statue now restored with a bright new flame with no further explanation. Coincidentally, the Statue of Liberty has replaced Napoleon waking to immortality, a sculpture by François de Rude which has left Orsay for the Louvre. As for the Senate, it had a copy of Bartholdi’s work founded - with the flame - to watch over its gardens.